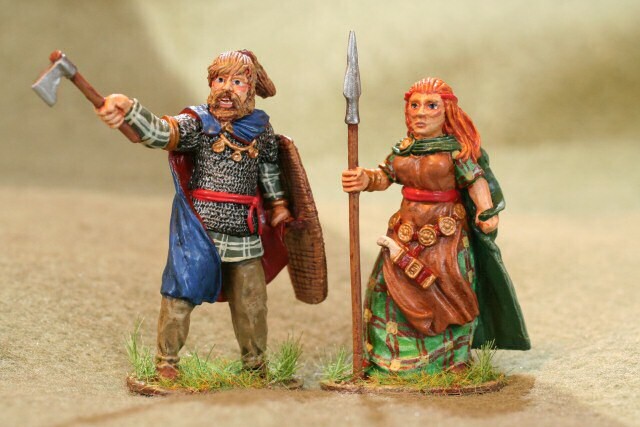 This article describes a set of 54 mm miniaturesfrom Alpha Miniatures.Sadly, that company is no longer casting and selling these miniatures.On the bright side, another company has bought the casting rights,and we may soon see these figures for sale once more. Shown in the photo are the Ancient German chieftain and the Spear Maiden.They look like Allemannis of the 1st or 2nd century A.D..They are painted with Foundry paintsand coated with Testor's Dullcote matte varnish.The matte varnish has come out slightly glossy, akin to an eggshell or semi-mattefinish, which is probably due to the 102 F (39 C) heat and 20% humidityof the Austin, Texas summer. There are 14 more ancient Romans and Germans awaiting painting. I hopeto finish them soon and display some photos at this site.Thanks for visiting and reading about my garden miniatures.More miniatures-related articles are atDan Becker's Miniatures and Models site. Last modified: Thursday, 09-Jun-2011 12:53:48 MST.